LG G6 is simply the perfect choice for your new smartphone investment. This device is designed with the 5.7” display and you will be able to avail several advanced features. This is probably the best deal for LG lovers where they can avail HDR screen, waterproof build and dual rear camera sensors. Let’s take a deep review about the LG G6 smartphone. You will definitely love the screen size. It is designed with water resistant body with IP68 technology. Well known for its attractive compact size. The dual lens wide angle camera ensures collection of impressive images. Equipped with all latest software including Google Assistant. Comes with SD card slot. All these smartphone models need Quad DAC with wireless charging option. You need to pay more as compared to available features inside. Needs some improvement over screen brightness. Processor may appear lagging behind for upcoming flagships. So, this product is already out. Probably, you must be curious to know the price range for this smartphone. But it will make you sad because even with limited specs and very little improvement over camera, this product is quite expensive as compared to other designs available in market. Its price tag holds the eye watering £649 value with a free SIM card; the fact is that several brands in the market are available with price range that is almost half as compared to this tag. Right after the release date, this product has been made available to most of territories. You can find this smartphone in several hands within UK itself. For certain limited time duration, buyers can avail 50% off for buying this device as an exchange over Verizon. Most of users are still hoping that with increasing purchase rate probably its price range will fall down. Well, this thing cannot be predicted so we can just wish Good Luck for your hopes. Even with its 5.7 inch screen, this device appears handy enough and allows users to operate it with single handed motion. The bezel size is minimized and aspect ratio is maintained at 18:9 to deliver stunning performance. It appears quite thinner and longer as compared to devices that have 16:9 aspect ratio. The front side of this design appears quite impressive with the rounded corners. The thin appearance of bezels on top and bottom portion makes its appearance for attractive. You can find this phone in white, black and platinum design where each one appears eye catching and impressive. In simple words we can say that this phone has everything that you love in big screen models and discards all those annoying features that you always wanted to get rid of. LG G6 is designed with impressive 2880x1440 pixel resolution that offers unique aspect ratio of range 2:1. Thus users can enjoy a tall but narrow screen design with easy navigation options. The 2:1 ratio means that the screen allows perfect fit for two perfect squares. This aspect ratio indicates that built in apps for this device have also gone through few changes so that they can stay compatible but it also indicate that users may face some trouble with third party applications due to this new screen size. But the great news is that you can scale your applications from display settings and there are three options available for aspect ratio with this screen size: for full screen- 18:9, for standard- 16:7:9 and for compatibility- 16:9. So, we must say that screen of LG G6 is still capable enough to deliver you much options. The stick applications such as weather, music player, address book, messaging app, dialer and email have also undergone few changes to work with this new screen size. You will be glad to know that with the little advancement in camera, it now became able to manage viewfinder in the upper portion of the screen and preview at bottom part. There is no doubt to say that viewing angles and color for this screen are adjusted well but it needs some improvement for brightness part as it appears hard to use in direct sunlight. G6 is designed with much conservative design as compared to its predecessors. This sealed unit never let the battery come out when it suddenly falls down and the battery inside it is replaced with the larger capacity package that leads to better performance. Also, you will appreciate the waterproof shell. But it has not received much advancement in terms of processor as instead of moving forward to latest designs, LG has still added Snapdragon 835 into it. This smartphone is covered with a perfect mixture of metal and glass where you will find two sheets of the Gorilla Glass as the Gorilla glass 3 is added to front side and Gorilla Glass 5 to the rear side. The frame is made up of aluminum that makes it look more attractive. The small size bezels on upper and bottom portion of screen with appear good and the overall hardware design simply leads to an impressive effect. You will be glad to know that LG G6 is working fine for almost all major careers in US. Tests were carried on T-Mobile version that is tuned to GSM, LTE and UMTS; it worked fine for international roaming as well as on T-Mobile. During these tests, top download speed as 9Mbps and for uploading it delivered the maximum speed of 28Mbps. This smartphone also works for dual band Wi-Fi, and extends support to Bluetooth 4.2 and NFC. Call quality for this device was almost acceptable; the speakerphone as well as earpiece both worked fine with enough loudness. It was also capable enough to cancel noise while managing the sound for traffic very well but yes, it do some struggle with wind that leads to garbled transmissions. You will not find any carrier branding over rear or front portion of G6, probably this is the major reason why it gives a neat and premium appearance. The well rounded sides make it perfect for impact resistance. There are very few smartphones in the market that can handle drops on hard surfaces and LG G6 is one of them. It was able to survive after 5 foot drops over rubberized surface during tests and it never faced any damage but note that if you drop it on concrete then you must expect an least some glass crack on backside. Also, one more interesting thing to notice about this phone is its IP68 waterproofing that allows users to work on their phone without any trouble even during little rainy weather. It was tested by rinsing it inside sink and it delivered amazing performance without facing any damage. LG G6 comes with Android 7.0 Nougat and the software layer embedded by LG is a bit heavy. You will observe sharp modification over icons, colors as well as for launcher and this time LG has included its own music application and gallery along with options provided by Google platform. When it comes out of box, you will find all the apps cluttered over the home screen but yes it is quite easier to alter these settings as per need. Users can access shortcut key to manage all applications. 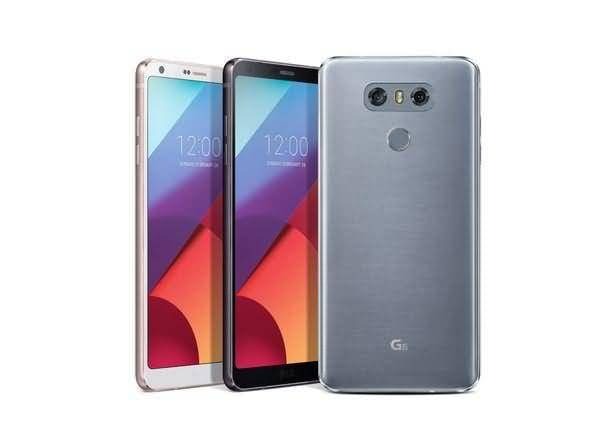 LG G6 comes with several preloaded applications such as Lookout, Evernote, five LG apps and seven career applications. One of the most advanced one is LG Friend Manager that helps users to manage several accessories inside this model. The advanced software tool set of LG G6 makes it suitable for multi window app use. Its 18:9 aspect ratio allows users to work with two square apps at a time with efficient multi window processing ability. The flow is further enhanced with the help of Google assistant. The interface looks mature enough with refined look where the icons and app drawer, both are well managed to give a premium experience. Although, manufacturers have added few efforts to update camera of LG G6 but it appears quite similar to its predecessors. You will find here the perfect combination of wide angle and normal camera lenses where both of these offer 13MP image quality. It has not received much quality improvement for aperture, not even for the pixel size so you cannot expect much better snapshots with LG G6. The main image sensor in this device use to come with optical image stabilization feature that offers great performance for stills with aperture setting of f/1.8. Another wider angle sensor option is f/2.4 but it does not have the same stabilizer ability so images appear less sharp. The wide angle lens in this camera allows users to enjoy more details on each shot. You can enjoy opening viewfinder and preview window together on the screen with its multiple window adjustment option. In simple words, the overall image quality of LG G6 can be rated to be good but we cannot call it stunning. It also demands appropriate light conditions to shoot the perfect still. There is no doubt to say that LG G6 can offer you quality experience for viewing video clips but the device somewhere lacks in audio performance. It does not possess stereo speakers; you will find only one at bottom of this device. It also misses the standard Dolby Audio Tweaks and Dolby Atoms. The single speakers try its best to deliver best performance but it is actually dominated by several powerful competitors around. One of the most heard complaint about this device is that its battery is non removable. Although, with this fixed battery arrangement LG G6 has been designed to offer dust and water resistant performance. The battery life for LG G6 is observed to deliver good performance when it is tested after coming out of box. The software updates lead to improvement up to about 25 percent. If you are a resident of US and wish to buy this phone over there then you can avail this product with wireless charging ability. But for people outside US, the USB Type C cable is added to the box that will take around 1 hour 30 minutes to charge this internal 3,200mAh battery. You will be glad to know that LG G6 offers USB Type C quick charge option so that users can enjoy fast charging feature even while using their phone on the go. When compared with the old LG series, this device is observed to have much refinement with lots of amazing changes. It comes with dual camera setup ranging between V20 and G5 but the sensors for both cases are having just equal resolution. The new screen size is definitely a great addition and the great news is that you can operate it perfectly even with single handed operation. Some of the most interesting specs associated with this new device are wireless charging, drop resistance and waterproofing. But, along with all these amazing features, you will have to face few downfalls and the biggest one in this list is limited battery life. If you are planning to buy a new Android smartphone then LG G6 is one of the best options for you. It’s all cutting edge features can make you happy with great response, the attractive curved screen, Qualcomm’s Snapdragon 835 processor, the advanced iris scanner, digital assistant, they all make this phone best choice for your next purchase. With all such features, LG G6 definitely become a great choice for Android lovers but yes you have to make a wild expense of $650 to buy this device.